The cellulose masks however are a totally different story. I seriously think these masks are awesome. They come in a box of 6 individually wrapped masks and are recommended to be used twice a week (after applying Spot Eraser). I use them once a week as a form of pampering especially since I’ve been having rough work days. What I absolutely love about these sheet masks is the texture. Most of us are familiar with paper sheet masks – the pre-soaked paper or fibre sort that you open up and lay on your face. You’d be familiar with how they are too big/too small for your face or don’t adhere well to your skin. These masks aren’t made of paper but a type of thick solid opaque cellulose material. It in fact feels slightly like a thick gel to the touch. I feel almost like the Man in the Iron Mask when I put these on – LOL! Interestingly the masks come sandwiched between 2 sheets of open weave net that holds the mask in place. You open it up, remove one sheet, place the mask on your face, pat it in place as it adheres to your face like a second skin, then remove the other sheet. Then, lie back and relax for 10 minutes while the mask cools your face and infuses it with the serum. The thick gel mask really sticks to your face so you don’t have it flapping around like paper masks do even as it dries and it does not drip. I had no reactions to the mask at all. Everything was fine and hunky dory! I’d use these masks not because it has whitening properties but because I love how plump and moisturized my skin looks after using it. RM250 a box isn’t cheap but when you consider that its spread out over nearly 2 months or more that’s not too bad. So these are my 2 recent forays into the realm of whitening/brightening skincare. Not surprisingly, they are mostly found in Asia. I can see the Lancome Cellulose mask firmly entrenched in my regular skincare regime for the future. Do you have a whitening skincare fave or do you use any whitening or brightening skincare? PREVIOUS POST: Stila Says: Goodbye Malaysia! NEXT POST: What’s good from Stila Cosmetics? last time i tried the bioxil whitening for 2 weeks, since 2 weeks of stock worth rm600 so i had some really high expectations. on whitening and brightening side, i saw the results. however, there is a stubborn patch of pigment on the side of my face just refused to disappear regardless of the stuff i use! gosh. Hmm… what happened to the rest of my comment? :S It disappeared after the first line! Anyways, i LOVE the spot corrector!! I’m on my 3rd tube now and i can’t live without it! 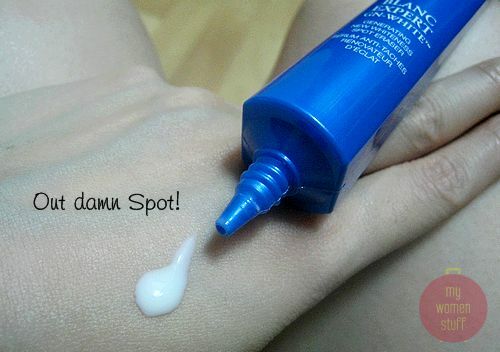 Wow what is it that you love about the spot corrector? Does it work for you? I do like it as a serum under my moisturizer but I’m going to use it up and see how it looks after a couple more months. And seriously? Whitening is big in India? Who’d have thought! Seriously, I have know an indian and a sri lanken in Singapore who do not wish to go for outdoor walks so that they do not get the sun and become dark. !?!? many whitening or brightening products that I’d tried don’t really deliver what they claim. Thus I don’t really buying any whitening or brightening products nowadays unless i’ve been provided a sample and I feel good from the product. anyway, i think u can give a try on this brand of mask “Silk Whitia”. currently i’m using the pearl finest powder whitening mask. it’s sold at SASA. bought in SG, but i suppose Malaysia should have it. cost S$20.90 IIRC for pack of 4, but usually i’ll wait for 1-4-1 or S$2/pc promotion. i don’t know what is ‘opaque cellulose material’, but Silk Whitia sounds kinda of the same material, and comes sandwiched in similiar ‘styrofoam-y’ material. but it fits my face very well, and doesnt slide of easily. I’ve used that before – did not quite like it for some reason. Perhaps I could take another look. Thanks. i was browsing around for product reviews and found this useful site of yours. 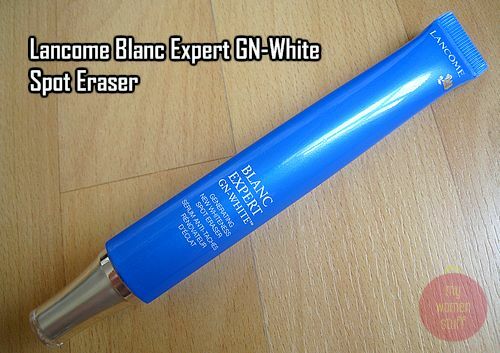 as for the whitening spot corrector, i used this a couple of years back when i was so into whitening. i have to say that it worked like a charm! it was really good that i only needed to use 2 tubes for my old pimple scars to lighten almost to an invisible effect, until now. 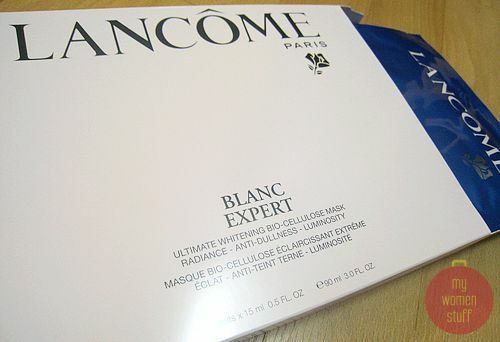 i guess for it to work really well, the secret is to use the entire whitening range from lancome. i stopped using them because i always exhaust their cleanser and toner too quickly and they’re not cheap. but i definitely recommend them to anyone as i didn’t have any negative reactions to lancome compared to others like clarins, estee lauder or shiseido. I am a SKII user for 7 years now. My first brand was Estee Lauder. I find that after using these two brands for a period of time, my skin is like stagnant, there is no difference and no improvement. My skin looks dull and lifeless. I met an old friend at the airport when I was on my trip abroad and she happened to give me a sample of Lancome blanc expert ultimate whitening hydrating cream and I used it, for a week. Friends I meet, like the glow in my skin. When I met my own beautician, she also remarked there was an extreme improvement in my skin texture and improved so much. I am now more confused as to whether I should move on to Lancome or stay put with SKII. I still have various SKII products in stock (approx. RM2k). Please advise, you beauty experts out there. Thanks. I have melasma, dark pigmentation on cheeks and forehead and they are spreading dramatically.I have this problem from the last 14 years its deep in my skin,i have tried a lot of stuff and nothing has shown any results so i would like to know what could be the best product for me.